This is our first of many giveaways that we will be hosting on FreshGiveaways.com. This giveaway ends on 9/17/2017. This giveaway is 100% free to enter and no credit card needed or any purchase. 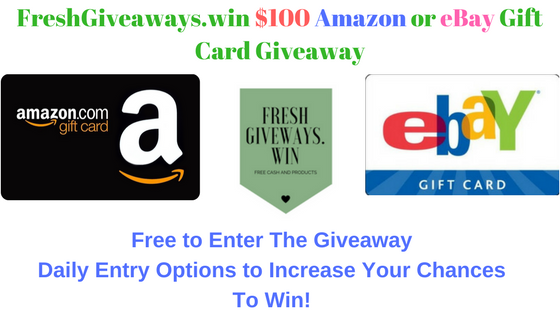 One winner will be selected and they will have a choice between a $100 Amazon gift card or a $100 eBay gift card. The gift card will be emailed to you. Must be over 13 and have adult permission to enter this giveaway. This Gift Card will be sent via email is USD value only. This giveaway is for only ONE gift card. Winner gets to choice between eBay or Amazon Gift card with a value of $100USD. Contact us at FreshGiveaways.win if you have any questions regarding this giveaway. There will be daily tasks for you to enter this giveaway to increase your chances of winning. Using Fake social media accounts or emails will void your entries and will be removed from the giveaway, your win will be voided and another random person will be selected. We reserve the right to modify the giveaway at anytime to include more entry options into the giveaway and chances for people to increase their chances of winning. Only one winner will be selected at the end of this giveaway 2017-9-17 11:59:59 PM, if that winner is voided due to cheating a new winner will be selected. No problem, thank you for entering. We have a lot planned for this new website and right now its kind of empty but soon we will gave a lot more active giveaways to share with you guys. Good luck to everyone who entered. If you entered yesterday with the old system, I’m sorry but you will need to enter again using the new giveaway tool from gleam above. I see Donna was the first one to enter =), congrats! I would never go near a shark, interesting articles about them. If I win the giveaway, I will ended up buying lots of Blu-rays. Thank you for all giveaway organisers. Thank you for allowing me to this fantastic giveaway. Thank you. I have entered the giveaway. Yes, absolutely. I have entered! i’m in it to win it!! Want to Stay Updated With Fresh Giveaways? Click Here for our Newsletter!! Fresh Giveaways Copyright © 2019. All rights reserved.